Who is your toughest audience? Smug editors? Cold critics? Nope. If you write children's books, your biggest challengers are those little kids who can make or break your reputation as an engaging children's author. Kids are lovingly touted for their honesty and innocence; but for an author who hears a four-year-old scream, "I don't like this. Stop reading! ", the comment is hardly cute. In fact, it's downright cutting. As a children's author, how do you make sure that you hear only happy shouts and giggles rather than restless fidgeting? First, you need to remember that children are not robots; like adults, they gravitate toward books with characters or situations to which they can relate. For instance, if you want to write a book about a cat named Frisky (children love animals, especially anthropomorphic ones such as the popular Clifford the Big Red Dog), you need to put Frisky into situations that are familiar to your child-based audience. Thus, Frisky probably isn't going visit his accountant to discuss retirement investments… Frisky is going to have adventures that help display his childlike attitude. Though it sounds like common sense to approach a children's story with a child's world view, there are many authors who, in their zeal to write a kid's book, begin to pepper their piece with adult-sized words and ideas. This is a very easy mistake; after all, to an adult, the word "negative" is accepted, as it's found in everyday conversations. But to a child, the word "negative" is hard to understand and unfamiliar; hence, a simpler word like "bad" might be substituted. Similarly, children's writers sometimes write overly complicated sentences just from force of habit. 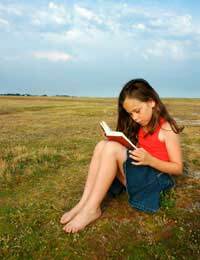 Kids don't appreciate more than a few words per sentence until they are reading longer chapter books (around 6-8 years of age.) And even then, it's better as a writer to condense one long sentence or divide it into two short ones. Writing historical pieces for children can be especially challenging but highly rewarding. Making a nonfictional individual come alive in the pages of a book or a short story can turn a toddler into a veritable history buff. However, it takes some creativity on the part of the author to breathe life into someone who is no longer living (such as Benjamin Franklin) or to turn an abstract concept (like democracy) into something that kids can understand. The best way to do this is to take one or two interesting incidents involving the historical figure or event and tell them in a very child-friendly way. The best part about children's writing is that there are unlimited ways to tell one tale, and with a young audience readily willing to accept the imaginary and the impossible, the only limits are those of the author's imagination. Be clever, be concise, and be childlike; if you do, you'll most likely be remembered by a generation of kids who can't wait to read your next work.